The Budd Rail Diesel Car, RDC or Buddliner is a self-propelled diesel multiple unit (DMU) railcar. Between 1949 and 1962, 398 RDCs were built by the Budd Company of Philadelphia, Pennsylvania, United States. The cars were primarily adopted for passenger service in rural areas with low traffic density or in short-haul commuter service, and were less expensive to operate in this context than a traditional diesel locomotive-drawn train with coaches. The cars could be used singly or several could be coupled together in train sets and controlled from the cab of the front unit. The RDC was one of the few DMU trains to achieve commercial success in North America. 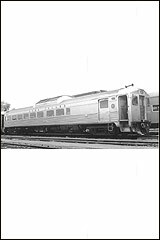 RDC trains were an early example of self-contained diesel multiple unit trains, an arrangement now in common use by railways all over the world. Special thanks for RDC sounds recorded by Paul Knowles. e.g. 300Hz. This will ensure a more "full" sound that does not appear thin or "tinny". some roads may change/upgrade prime-movers, or change a normally aspirated engine with turbo-chargers etc.